Beautiful photo farmgirl! Kind of chilly here in Indiana today. Lucky you with the warm weather. It's been raining here but finally the sun is coming out. Great photo. Winter was wierd to begin with -- very mild. It's been warm, humid and windy here. We finally got much needed rain, thankfully. You are warmer than we are in Key West today ! I love spring in the north and your photo is marvelous. 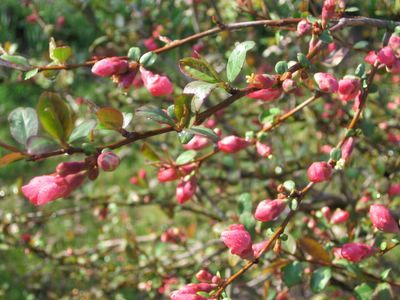 The very early white, pink or red flowers resemble apple blossoms. The flowers are followed by aromatic, greenish-yellow fruit that makes a tasty jelly. This shrub is great for training against a wall. Hope that helps, Happy Spring! yes, quince. we had the same question. lots of jelly recipes. wood is used for knife handles.